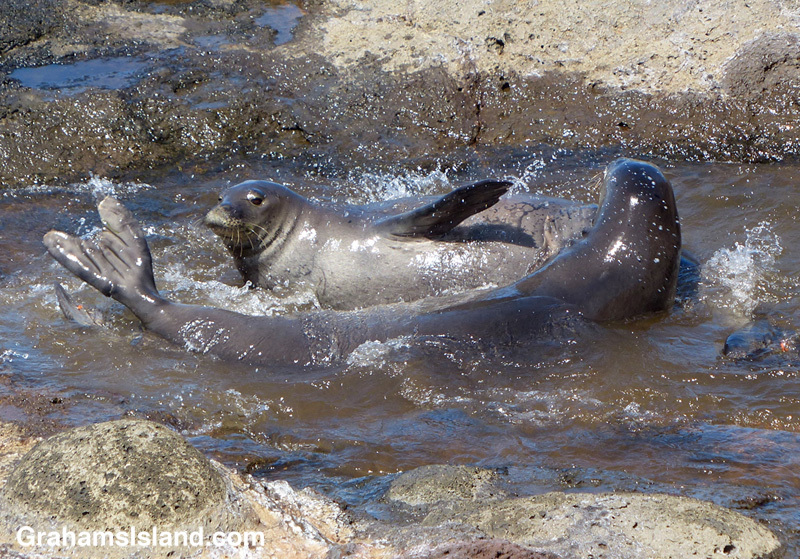 Last month, I posted here about how unusual it was to see two Hawaiian monk seals in the same tide pool. Those two, identified as IO5 and BOO, were stretched out, resting. 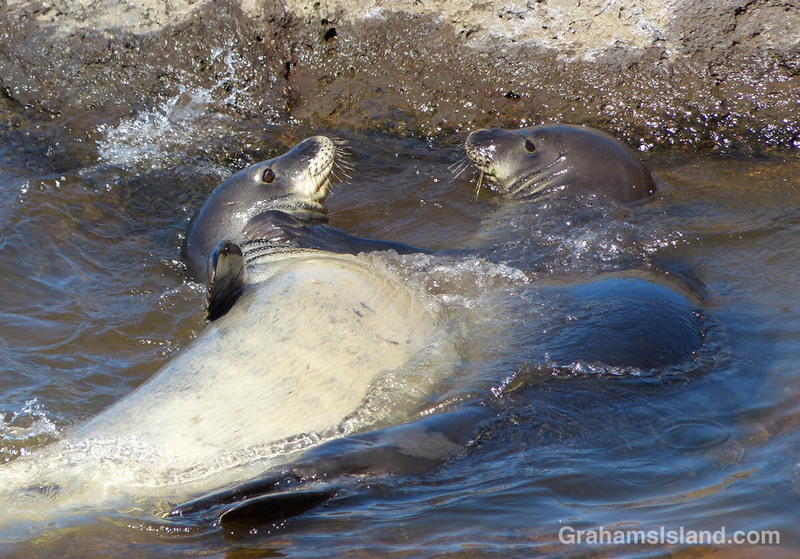 A couple of weeks later, I came across the same two seals in a different tide pool, but definitely not resting. Bouts of circling and interaction were interspersed with them just lying together or in close proximity. Mostly IO5, the male seal, seemed to be the pursuer, but when he stopped, BOO, the female, was just as likely to reinitiate the activity. Eventually BOO left the water and IO5 followed. He made another attempt to initiate some action, but she seemed to have tired of the game. Eventually, he eased off to the side not far away, and by the time I left, the two of them seemed to have settled in for some rest. To me, IO5 looked like he was interested in mating, and half the time, she seemed amenable, but I’m not sure they’d do that in a tide pool. None of the barking, slapping, or nipping seemed to have any malevolence behind it; after such exchanges they mostly settled down again next to each other. IO5 is on the left in the top photo, the right in the middle photo, and the foreground in the bottom photo. He’s the seal I see most often and his expression in the middle photo is quite representative of him. 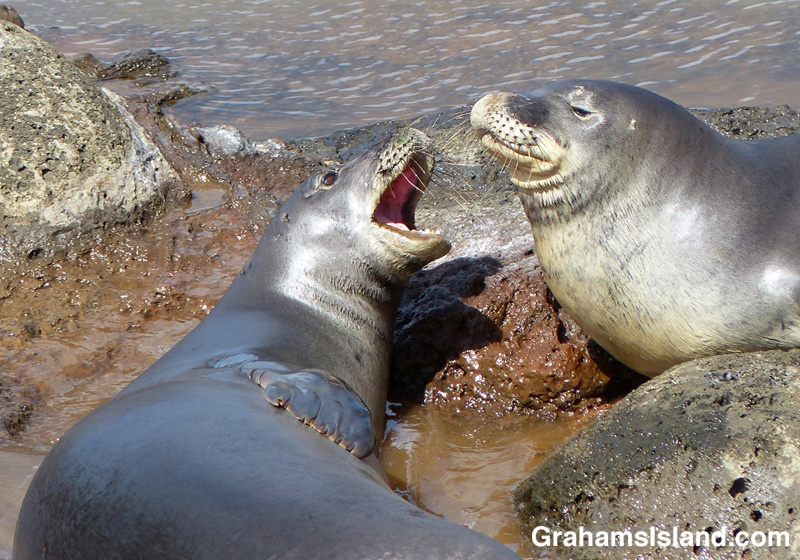 For more information about Hawaiian monk seals, see here or here.